A blazing fire can add a hint of romance to the air, so plan a date outdoors by a roaring bonfire on the beach, hudded next to the one you love -- or the date you're just getting to know. To ensure you have an opportunity to indulge in the romance in the air, plan ahead and bring along all of the creature comforts from home, whether for relaxing, imbibing or any other activities you would like to enjoy by the fire. Enhance your romantic bonfire evening with a little dancing in the dark. Sitting on the beach on a towel is fine when you are trying to catch some rays, but when you are planning a romantic night beside a bonfire, a towel isn't going to do it. Bring a blanket to spread out on the ground big enough for the both of you to sit -- and maybe even recline so you can watch the twinkling stars above. Bring a second one in case your bonfire date starts to get cold as well as something to sit on, such as a couple of beach chairs or a chaise longue for the two of you to share. A glass of wine or champagne is comforting to have when you are sitting by the fire in your fireplace, so it's also a suitable drink to share by a bonfire as well. White wine, such as chardonnay or pinot grigio, or red wine, such as a pinot noir, a Shiraz. Champagne or sparkling wine are all potential choices. To help keep you warm on a cool night, bring along a comforting thermos of Irish coffee. If you would prefer to enjoy nonalcoholic beverages, hot cocoa and flavored coffees will make warming accompaniments. Bring food that you can make together and share with each other. Sweet treats, such as s'mores, can be made easily by the heat of the bonfire. For something a little more special, pick up a quart of fresh strawberries and fill a stainless steel pot or bowl with semisweet chocolate morsels. Set the pot close to the fire and let the chocolate melt in the pot. Dip the strawberries into the warmed chocolate and feed each other chocolate-dipped strawberries. 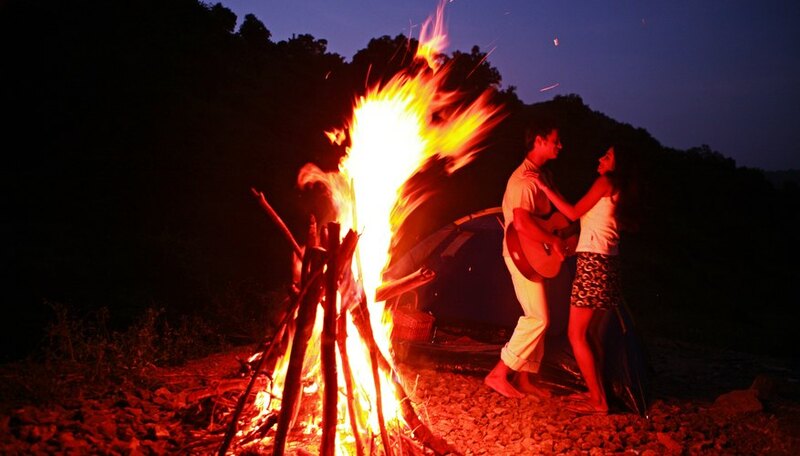 Music can set the mood for a romantic evening by the fire. If one of you knows how to play, an acoustic guitar can make the evening even more romantic. Otherwise, a portable CD or MP3 player, filled with fresh batteries, of course, and a variety of mixed CDs made for the occasion can help you to express your love for each other. S., Mark. "What to Bring to a Bonfire Date." Dating Tips - Match.com, https://datingtips.match.com/bring-bonfire-date-13196848.html. Accessed 24 April 2019.